It is undeniable that there are similarities between the hiring and dating processes. We hear that employers’ reviewing of CVs has been “Tinderised” due to an inundation of applications. We are completely aware that the person sitting opposite us at the dinner or interview table may have “visited” any given social media site we have put our name on (causing mass homefeed edits and, for the brave-hearted who scroll back further than 2011, the cringe-worthy reminder of what we judged as #banter in sixth form). We even fret on the journey that the nail we just accidentally chipped will betray us as a mess of frantic disorganisation. But gone are the days of women taking a passive role in either sphere; getting more women into the boardroom is a widely discussed issue and, though we hold a secret soft spot for a fairy-tale Ross to our Rachel, a Zac to our Kelly, a Mr Darcy to our Bridget or even a Kanye to our Kim, it must be said that women have shaken off their roles as “chasees” and are taking on the world, “Carpe Diem!” emblazoned on our superwoman leotards that we hide under our work clothes. 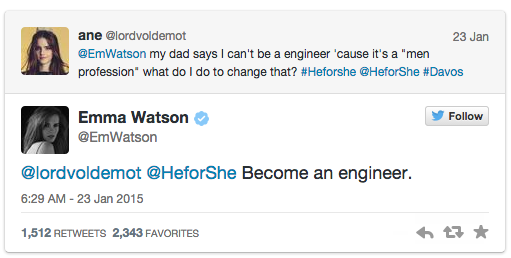 We need only to look to Hermione, sorry, Emma Watson, as a bastion of the progressive attitude of young jobseekers. However, it must be said that rejection from a potential employer or a potential Mr Darcy can be tough. Though it might leave us wanting to spend the rest of our days in a windowless room smothered in cats, we must always remember one stock truth: It is better to have been interviewed and rejected than never to have been interviewed at all. So this Valentine’s Day, why not take a shot at a great job as well as love and spend some time researching recruitment agencies that are especially tailored to graduates, such as our client Non-Stop Recruitment? The path to your “happily ever after” might be long and you will almost definitely be interviewed by a few frogs along the way, but keep your heart set on finding your Prince Charming of jobs, it is out there waiting!